Vintage - Kaysons Fine Bone China of Japan Tea Set in the "Golden Rhapsody" Pattern. 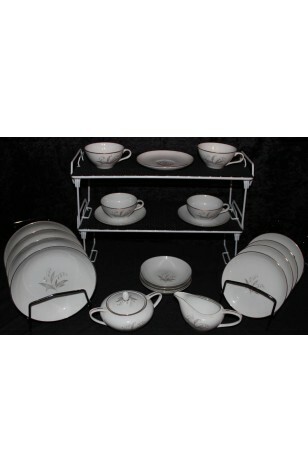 22-Piece Set, Service for (4) Four.. (missing one Saucer), Circa 1961-1966. This Beautiful "olden Rhaposdy" Designed Tea Set by Kaysons Fine China of Japan is a very popular pattern Which is no longer being produced. This is an Elegant Floral of the Lily of the Valley, with Gray Leaves, and 22kt Gold, Metallic Accents. This is China that can be used for the Finest of Tea Parties, as well as everyday, less formal get togethers. All Pieces are Rimmed in 22kt Gold, as is the Knob on the Sugar Bowl, and Handles on the Sugar Bowl, Creamer and Cups. Excellent condition. This Beautiful "olden Rhaposdy" Designed Tea Set by Kaysons Fine China of Japan is a very popular pattern Which is no longer being produced. This is an Elegant Floral of the Lily of the Valley, with Gray Leaves, and 22kt Gold, Metallic Accents. This is China that can be used for the Finest of Tea Parties, as well as everyday, less formal get togethers. All Pieces are Rimmed in 22kt Gold, as is the Knob on the Sugar Bowl, and Handles on the Sugar Bowl, Creamer and Cups. In Great Resale Condition unless noted below or in pictures. 3 - Saucers - 5 3/4"
4 - Bowls - 5 5/8" - Use as Fruit, Sauce Bowls, etc..